Onet sudah teradopsi bulan Desember 2016. 🐕🐕 Good morning from Onet... ^^__^^ Betina, ukuran medium pendek, 2 tahun, sudah steril & vaksin. 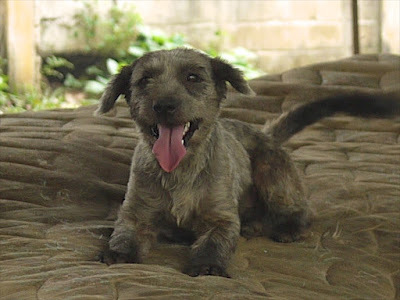 Onet was found sleeping on the sidewalk of the street one night in the rain, and she didn't run when we came near her. Mungkin Onet dibuang dan akhirnya kelelahan dan kami bisa membawanya. Onet is very human-oriented, and can get along just fine with other dogs, but still she focuses on the humans not play with her friends. ↪Or you can also help us by donation: Rek BCA a/n Shirly Tiolina Pasaribu, to support our 50 dogs now. Most importantly: spay/neuter and love your dogs.